Did you buy any utility stocks or ETFs on their late-September pullbacks? If you did, you may be sitting on a nice profit—maybe 4% or more, if you timed things just right and bought on September 26, when many of these shares bottomed. That would be a warm fuzzy, given the broad market’s current pullback. 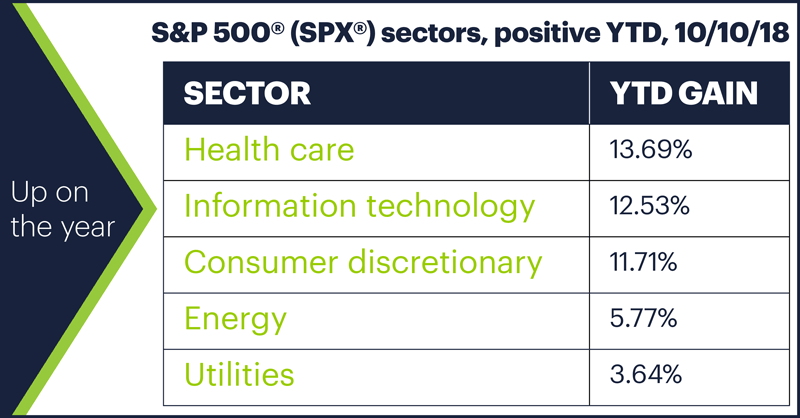 Yesterday, utilities led all S&P 500 (SPX) sectors with an approximately 3.7% gain over the most recent five days, compared to a 3.4% decline for the SPX—something that fits into the traditional pattern of utilities as a “defensive” sector. Utilities led the market last week, too, as they often did earlier in the year when the market was in sell-off mode, although “leading” sometimes meant losing less than other sectors. As of yesterday, utilities were one of five S&P sectors up on the year, although they were at the back of the bullish herd (table above). Although it’s unclear how much of the recent upswing has been the result of investors getting defensive with their portfolios, the current move is in keeping with what has happened during past SPX downturns. 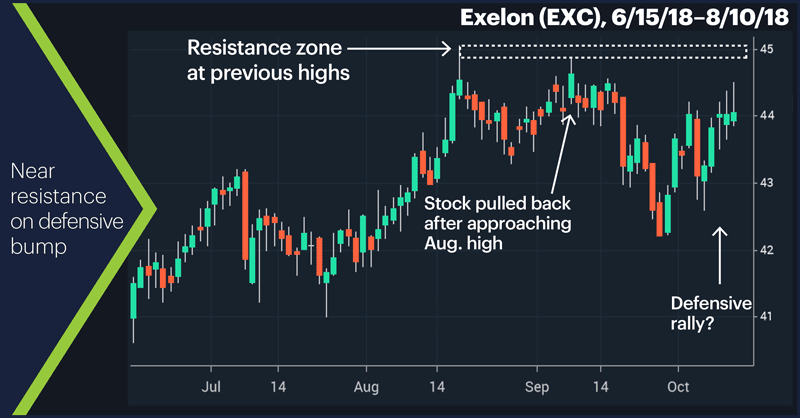 What is clear, though, is that EXC, along with several other utility stocks and large utility ETFs, is trading right around the resistance formed by recent highs. The end of the broad-market pullback could, as it has in the past, pull the defensive rug out from under the utility sector, at least temporarily. Add to that the robust up move these stocks have made the past couple of weeks, and their positioning near obvious resistance, and it’s not inconceivable that some traders who bought them on the last pullback may think about taking profits, or even consider short trades. Bulls may see an opportunity to get in at lower prices. This doesn’t imply utilities have peaked for good. There’s some evidence that utilities often rally in the final months of the year, although they also tend to underperform the broad market during this traditionally bullish period. Merck (MRK) tacked on a second-straight record high despite the broad-market decline and its own intraday pullback. December WTI crude oil (CLZ8) sold off more than 2% yesterday, taking down many energy stocks with it. Today’s numbers (all times ET): European Central Bank (ECB) minutes (7:30 a.m.), Consumer Price Index (CPI) 8:30 a.m., EIA Petroleum Status Report (11 a.m.). 1 CNBC.com. An unlikely winner is emerging in the stock market: utility stocks. 5/1/18. 2 MoneyShow.com/Stock Trader’s Almanac. A Seasonal Trade on Utilities. 3/7/18.